Central High School students sold water bottles to raise money for water filtration and bottle-filling stations. Now, other schools in the city want to do the same. Anna Okropiribce, 16, drinks from the water fountains at Northeast High School only when she's "desperate." The water is warm and metallic-tasting. "It's pretty gross," she said. "Once, I filled up my water bottle, and the water wasn't clear. It was gray. I got scared. I was like, I don't know if I should drink this." That's cause for concern, given that poor water intake is a likely factor in a startling phenomenon outlined in research published Thursday by a Children's Hospital of Philadelphia doctor. It is: The childhood risk of kidney stones - an affliction historically found most often in middle-aged white men - has doubled in less than two decades. The risk increased the most for adolescents, girls, and African Americans, pediatric urologist and epidemiologist Gregory Tasian found. So, Children's - along with Philadelphia city agencies, the School District, and other partners - is pushing to improve water access in Philadelphia and particularly in city schools. Broken and dilapidated fountains have long been a source of complaints for students and teachers, who have gone so far as to demand water access in contract work rules. Some local students, meanwhile, are taking steps to improve their schools' drinking water. Tasian, whose research was published in the Clinical Journal of the American Society of Nephrology, said he first saw the kidney-stone increase when he began practicing in 2005. "Urologists who had been in practice 25 or 30 years were saying, at the beginning of their careers, the children with kidney stones were those with really rare and inherited metabolic conditions," he said. "Now, we're seeing otherwise healthy children who just develop kidney disease much earlier in life." Tasian and his colleagues analyzed nearly 153,000 medical records, dating from 1997 to 2012, from South Carolina, one of a few states that maintain a complete claims database. In that time, kidney-stone incidence increased 4.7 percent annually among teens, and 2.9 percent per year among African Americans. There was a 45 percent increase in lifetime risk for women. The painful mineral deposits are passed naturally 70 percent of the time. The rest require surgical removal. Kidney stones can be a chronic condition and have been linked to elevated risk of chronic kidney disease as well as cardiovascular and bone disease. But because they are still rare in children, not enough is known about the best course of treatment, Tasian said. Victoria Tappan, 16, of West Chester, said her mother, Tami, suspected kidney stones four years ago, when Victoria first experienced severe pain that left her writhing on the floor. Tami Tappan, who had suffered kidney stones herself, took her daughter to the emergency room. "They told her: 'She's 12! She doesn't have kidney stones,' " Victoria recalled. Next week, she will have her sixth surgery to remove a kidney stone. The pain keeps her up most nights and has kept her out of school for weeks. "That's hard, because my disease isn't something you can see," she said. "People don't understand or don't believe I'm sick." High sodium and low calcium intake are also connected to kidney stones. In Victoria's case, the tendency is at least partly hereditary. But she's adjusted her diet - and, she said, "I drink a lot of water." Victoria's misery is sort of a worst-case scenario in what Tasian sees as a broader public-health challenge. "Many people, especially children and adolescents, are very dehydrated," he said. "If we can get adolescents to drink more water, we can very likely reduce the chance they are going to develop stones." He's been trying to figure out what Children's Hospital can do to help increase drinking-water access around the city and especially in public schools. Federal law requires free drinking water at lunch, and teacher contracts call for one water fountain per floor. Philadelphia School District spokesman Fernando Gallard said the district did "meet or exceed the standard." Some teachers say students are going thirsty. Jesse Gottschalk, a fourth-grade teacher, said the only potable water at William Cramp Elementary School was in the administrative office, the nurse's office, and the gym. Water in classrooms and the cafeteria, he says he has been told, is not potable. Students complain frequently. In many cases, water may be safe to drink but not appealing, said Christine Knapp, the city sustainability director. Until recently, she was director of government affairs for the Philadelphia Water Department; now, she hopes to collaborate with the Water and Public Health Departments, the schools, Children's, and the nonprofit Food Trust to address what she said might be mostly a perception problem. "Sometimes fountains are old," she said. "They're often located near bathrooms or garbage cans, which sends the signal that this is part of waste." Simply adding filters, bottle-filling stations, and better messaging around fountains can make a difference, she said. "You have to make it appealing, especially for kids." Some students have tackled the issue themselves. 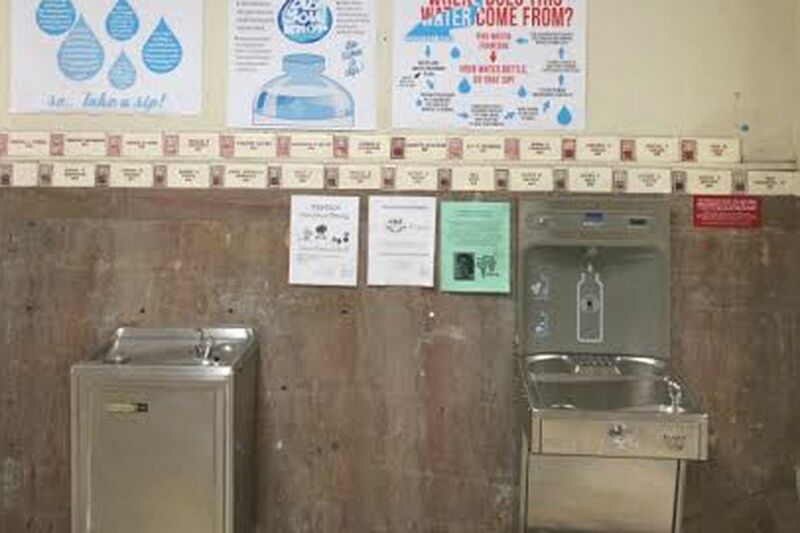 At Central High School, students in Galeet Cohen's environmental science classes over the last two years raised funds for three "hydration stations" where students can fill bottles with filtered water. Jada Parris and Bonnie Zheng, both 17-year-old seniors, said they collected more than $3,000 last year through a GoFundMe campaign, sales of reusable water bottles, and an alumni gift. That was enough to buy two water-filtration systems, which the School District installed. Parris said she - like most students - had never even considered drinking from the school's old fountains. "We wanted to put in these fountains to build confidence in our water infrastructure at school," Zheng said. Now, the fountains are gathering places, Cohen said. They are where clubs post fliers about coming events, since almost every student uses them. Dwayne Wharton of the Food Trust said the nonprofit and the city Public Health Department had been promoting water consumption since 2014, with the Partnership for a Healthier America-funded Drink Up Philly initiative. He hopes to tap philanthropic and corporate support for more hydration stations, and to encourage collaboration with the city and schools on the issue. And, he's trying to help students around the district duplicate the Central students' success. Students at Northeast and Girls High Schools have expressed interest. "It really shouldn't have to be up to the students to do it," Wharton said. "If [school] budgets can cover it, that's fantastic. But I'm really happy to see that students aren't waiting."